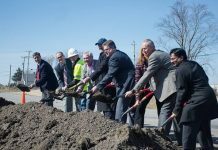 Fulcrum BioEnergy says that it has selected Gary for the location of its Centerpoint BioFuels Plant, which will convert municipal solid waste into low-carbon, renewable transportation fuel. Published reports indicate the project has a $600 million price tag. Construction is expected to begin in 2020 and will take approximately 18-24 months to complete. Once operational, the Centerpoint plant will divert and process approximately 700,000 tons of waste from the Greater Chicago area. The plant will process the waste, which will be converted offsite into a prepared feedstock, and will produce approximately 33 million gallons of fuel annually. Centerpoint will deploy Fulcrum’s proprietary process which reduces greenhouse gas emissions by more than 80% when compared to conventional fossil fuels and will generate hundreds of jobs in the region, creating 160 full-time permanent jobs and 900 construction jobs.